11am-1pm Horse-Human Connection – Come Hug A Horse!!! 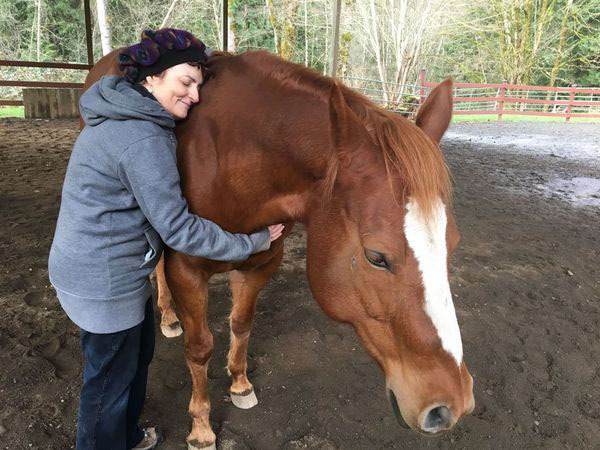 Would you like to spiritually connect, heart to heart, with gentle horses in Snohomish? Ella, Zea, and the other horses at Centaur Development Wellness Ranch in Snohomish are natural healers and love to share their gifts of being able to connect, on a soul level, with people. By brushing, touching and breathing together with the horse that chooses you, a heart connection is created that will inform, nourish and inspire you. The first time I visited Centaur Development Ranch, I made a deep-heart connection with Ella and we entered into a very quiet, spiritual place. We’ve been hosting this event for two year. Time and again, attendees have had amazing experiences, from beginning the process of overcoming their fear of horses, to being surprised by the connection that can be made on a soul level, with these majestic beings. Stacy, their human, knows very well that this connection is life-enhancing in many ways, and the horses seem to sense exactly what we need at the moment we meet them. Equine Professional and Life Coach Stacy Lewis will be facilitating. She has been partnering with her wonderful horses for more than 10 years at her spacious Snohomish horse ranch, helping people create that special horse/human bond. Please see Stacy’s Centaur Development Wellness Ranch website for more information about Stacy and her horse partners. The price is $40. Save your spot by registering HERE. This is one of our favorite events because, as our post-event evaluations repeatedly show us, and as all the attendees say, it’s such a magical experience. If you love horses, want to be around horses, or are simply drawn to the Spirit of the Horse, you will cherish this learning and healing opportunity. Space is limited to 8 participants, so REGISTER soon! This is a rain or shine event as we are blessed to have a covered arena! All activities are done on the ground, so we will not be riding.